So you made your coffee and you drank it too! While making coffee in a French press gets you some really tasty coffee, it also leaves you with a bit of a mess. To ensure quality coffee in every brew, it’s important to know how to clean a French press properly. Read on for step-by-step instructions for cleaning a French press. Cleaning a French press regularly, will ensure pure and pristine coffee every time. The first step in cleaning a French press is to remove the coffee grounds. Although this sounds like an easy task, it can be somewhat of a pain. Gently tap the bottom of your beaker over your compost or garbage to get the majority of the grounds out. Some grounds may get stuck, so use a spatula or wooden spoon to scoop out the remaining bits. Never use a metal spoon to prevent scratching or breakage. Rinse the beaker and the coffee plunger of any extra grounds. You can also remove the beaker to rinse the outside and between the press stand. Disassemble your French press into its separate components; the lid, the coffee plunger, the filter screens, and the disks. Disassemble your French press into its separate components; the lid, the coffee plunger, the filter screens, and the disks. Naturally, the grounds will get trapped between the three disks. Separate them and give a thorough rinse to prevent any build-up from occurring. If you wish to, wash your beaker with light soap and use a soft sponge to give it a scrub. Some coffee aficionados prefer not to use soap and instead just give the press a thorough rinse or use baking soda to prevent altering the taste of the coffee. Using a soft cloth, sponge or brush, gently scrub all your French press parts including the plunger and filter screen making sure to remove any remaining coffee residue. Once scrubbed clean, give all components a thorough rinse to ensure no soap stays behind. If this happens, the soap will alter the taste of your coffee. Carefully lay the separated coffee press parts on a towel or drying rack and leave standing to air dry. Or if you prefer, towel dry. Putting a French press back together looks more complicated than what it actually is. 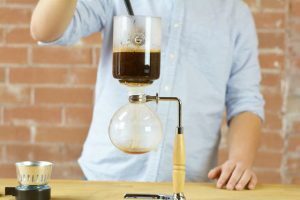 Simply start by sliding your cleaned beaker into its holder. Place the retaining disk on a flat surface. This piece has a screw that attaches to the plunger. Next, place the mesh filter screen on top of the retaining disk, followed by the spring disk. From top to bottom it should have the spring disk, mesh filter with the retaining disk on the bottom. Refer to the picture as reference. Once properly stacked, tightly screw the lid and rod duo into the disks and filter. Voila! Your press is ready for use and you’re now ready for your next cup! Always use coarse ground coffee to start. Fine to medium ground coffee will give you a gritty cup and can clog the filters. After use, clean with a soft cloth, sponge, or nylon brush. Avoid harsh scouring or metallic pads as they can scratch the beaker, leading to cracks later on. Coffee grounds can easily be discarded into a compost bin rather than putting them down the sink. A few grounds down the sink is fine, but any more and you risk clogging the sink. Plus, composting helps the environment! Do not use steel brushes, hard cleaners or polishing powder as they will scratch the surface of the glass or even plastic or stainless steel. When not being used for a long period of time, dry thoroughly and place in a plastic bag or a kitchen cupboard for storing. The best way to clean a French press may just be the simplest way to do it, by hand. When you disassemble the press and open up the layers of the filter mechanism you will clean it best. Sometimes coffee grit can get stuck in between the filter layers. Also by washing it by hand, you will ensure you don’t break any beakers. So if you do use a dishwasher for the glass beaker make sure you only place it on the top rack. French presses will wear and tear over time. Luckily, there are replacement parts such as filter screens, beakers, and coffee plungers available to replace your worn parts. Beakers can break with one slip, but the great thing about them is they’re universal in size and can fit in just about any standard press. This rule also applies to filter screens as well. We suggest replacing your filter screens one to two times a year to keep things fresh. How often should I replace the coffee press filter screen? In general, you shouldn’t need to replace the filter screen that often, unless it frays or teats from frequent use and cleanings. If you use your French press regularly, your screen should last you over a year without issue, sometimes much longer. Also, the screen should be replaced with quality 18/8 stainless steel filters when due. I have trouble screwing filter and disc into rod. Any suggestions? I have trouble trying to screw filter and disc into rod. Any suggestions? I never used to take it apart at the filter, just rinse it out. Eventually it plugged up. So I guess I should clean it properly now. who knew . Do you have a shatterproof French Press? I have broken my coffee press glass a few times now and I would prefer to get a shatterproof french press so I dont have to deal with that any more. Since Im lazy I dont unscrew the screen filter of the French press every time I use it, but I do use mine daily. I probably wash that every 3 or 4 uses by taking it apart. Has worked well for me so far, without giving me any trouble. French Press is the best coffee maker. With it I can make coffee better than electric coffeemaker and Starbucks. whoa1h this blog is great i love reading your posts about coffee. Keep up the great work! You know, a lot of people are looking around for this information, you can aid them greatly. Making coffee and tea is indeed a bit of an art. Thanks for sharing it and for helping those in need. Phillip.